Operates a financially self-supporting motor pool program by assessing fees for the acquisition, operations, maintenance, repairs and disposal of state vehicles rented by various agencies. GASOLINE – Regular grade 87 Octane gasoline is available from self-service pumps at the Motor Pool garages located at 869-A Punchbowl Street in Honolulu and at 744 Mua Street in Kahului, Maui. Gas cards, will be issued to agencies submitting written requests with state vehicle identification and billing account information. 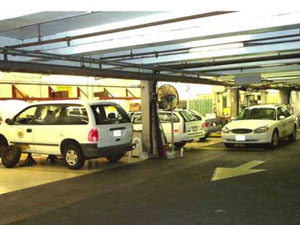 REPAIRS – Regularly scheduled oil and filter changes, safety checks, and other repair services such as tune-ups, tires, brakes, and air conditioning repairs are available for state vehicles on Oahu and Maui. Submit a written request to establish a billing account and call the motor pool to schedule appointments.